'Monkey Business' is fun and convenient for every age group. It is near the bike trail, 75 yards, three houses to the best beach, and a four minute walk to Coligny with its shopping, restaurants, and entertainment. What sets this home apart is the outstanding attention to comfort evident in every detail. From the spectacular pool (largest private pool in NFB) with room to swim laps, to good reading light in the bedrooms, to every imaginable utensil in the kitchen, the owners have thought of everything. The decor is fabulous - the art, rugs, furnishings, and decorating combine to create an atmosphere that is special from the moment you walk in. 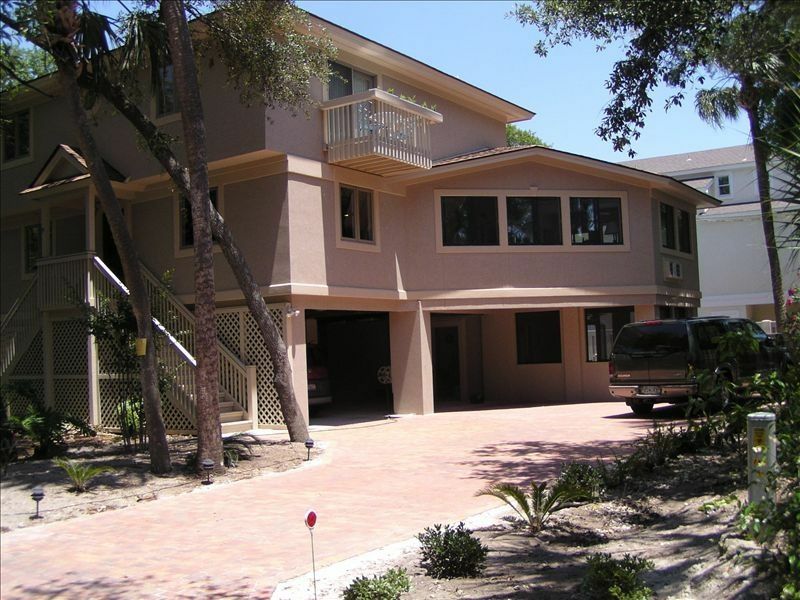 The owners have used their experience as bed and breakfast owners and long time Hilton Head renters and owners to make this home perfect for any vacation. First Floor: Enter into the large living room, furnished with two leather sofas and a linen sofa, swivel rocker, Romweber case goods, 32 in. HDTV, bamboo hardwood floor and an interesting designer rug. Dining Area: Large dining table, with extensions seats 16, beautiful tile floor. Kitchen: Newly remodeled, completely equipped, granite counter tops, island with four swivel adjustable stools. Brand new appliances. Owners are gourmet cooks, and it shows. Multiple pots of every size, baking pans, casseroles, knives, serving pieces for a crowd, several fun sets of dishes, fish forks and lobster crackers, and glasses galore. Even a cabinet fully stocked with spices. Small appliances include a griddle, waffle maker, mixer, blender/smoothy machine. Wet bar and galley area provide convenient access to the back stairway to the pool as well as living room and stairs to second floor. Three bedrooms on the first floor, each with private entrances and private bathrooms with walk-in showers, two with king beds one with a set of twins. Three bedrooms on the second floor: master with king bed, private bathroom with shower/tub combination and crib in alcove; 'dorm' room with two sets of bunks, full size beds on bottom, singles on top, plus pull out trundles, this bedroom shares a large bathroom with the third bedroom, king bed. The bathroom has a shower/tub combination and double sink. Screened Covered Porch: A fabulous new addition: enter from the kitchen/dining area or from the deck to back porch and stairway to the pool. Comfortably furnished with teak table, chairs, sofa, love-seat and rockers. Pool: The largest private pool in North Forest Beach. Enjoy the built in spa. The roped off shallow end is great for kids. Toddlers are happy in the pool and on the deck for hours while the next generation can swim laps, play volleyball, or laze on rafts. Frontgate lounge chairs, patio table with chairs and round table with comfy Brown Jordan bounce chairs ensure plenty of seating. Large gas grill is available as well as a 'Big Steel Keg' charcoal smoker and grill.. Screened in porch at ground level is adjacent to the pool, a great place for shade and to relax, access to pool deck and to ground floor air-conditioned 'pool kitchen', with second electric range and refrigerator. Garage/Storage area is stocked with toys for your use. 4 adult bikes, 2 sit-on-top ocean kayaks, beach chairs, cart, sand toys, rafts, floats, boogie boards, balls, jogging stroller. The backyard pool area is completely fenced-in and private. At Monkey Business a car is not necessary. Access to the best beach area, restaurants, supermarket, shopping, miniature golf and tennisare all within an easy walk. Wireless DSL service is available throughout the house. Cable TVs in all six of the bedrooms, some with VHS and DVD built in. Fax machine and printer, 6 Cable TVs (in all bedrooms some with DVDs), Screened Porch, Private Pool with full array of deck chairs, lounges, floats and poolside tables and chairs, Gas Grill, 6 Adult Bikes, Two Kids' Bikes, Tricycle, Beach Chairs, Beach Toys, High Chair, fully fenced yard, Keyless entry system, NO SMOKING! NO PETS! Property great! Anything you could want was available to you. The owner was extremely nice! The house was great ! We were close to the beach, Coligny, and many restaurants are within walking distance. The pool was amazing!!!! The two rooms attached to the pool area added to the convenience of the house. Look forward to staying in same house again! We look forward to our guests returning.. We work hard to exceed our guests' expectations. Our repeat stay at Monkey Business and we loved it -- AGAIN! This was our 2nd stay at Monkey business and we had an even better time than before (if that is even possible!) We had new friends staying with us this year and they were equally as excited because of all we had told them about your beautiful home! The rooms were spectacular, the atmosphere is wonderful, and the location is absolutely perfect! I think we used our cars only a handful of time to play golf, go para-sailing, and to go out to eat in Sea Pines. Other than that, we either rode our bikes or walked to everything! Your home is amazing and all 11 of us had a wonderful time! We have seen other houses that are rentals in HHI, but yours is FAR superior in all aspects- location, price, amenities on site, the pool, and all the extras! The pool and hot tub are 2nd to NONE and is easily the envy of others who are renting. The privacy is just perfect for the families and we love that the sun is over the pool for the entire day! We counted our steps from the driveway to the beach -- 102 steps. I think it takes less than 5 minutes!! The house is so close to Coligny that anytime we needed anything at the store, we just asked one of the kids and they hopped on their bike and rode off to the Piggly Wiggle, Carolina Cupcakes, or the bakery. We definitely did not want to leave and we will definitely be back again! Thank you Bill and Jackie for allowing us to stay in your beautiful home once again! We just spent a relaxing vacation at 'Monkey Business'! The property is just as described. The furniture and bedding are comfortable and well cared for and the kitchen has every appliance and gadget that you could want. The location is perfect, a short walk to the beach and also Coligny. We could easily have stayed here without a car except for golf. We had a couple of small problems when we arrived and the owner was quick to respond and resolve the issues. We have rented through rental agencies on previous trips and have had problems that were either ignored or not taken care of promptly. The owner truly cares not only for his home but wants his renters to have a great vacation! I would highly recommend this home! This House has Everything, including great owners! Our 5th stay on Hilton Head Island and our first in a home as we usually rent condos. After careful research, our 3 family group of 12 chose “Monkey Business” primarily for its location near the beach and Coligny but also for the pool, well stocked kitchen and room arrangement. This well decorated gem of a home far exceeded our expectations. It lacks nothing. The kitchen was so well stocked we ate in most of the time. Beds were comfortable and the porch with the windows open and breeze coming in was a lovely place to enjoy the morning coffee. We are an active bunch and our teens were never bored with the outstanding pool with the diving board, basketball hoop and volleyball net. When they had enough water, the kids jumped on the bikes to explore the island. At the end of the week, no one wanted to leave. Ever. Accommodations were as described. Plenty of room for 11 older gentlemen. Centrally located and easy access to golf. Since we did most of our own cooking , there were plenty of dishes,utensils etc. Would definately consider this home if we choose Hilton Head as next years destination. Very good communication with owner. 75 yards, three houses to the beach; three short blocks north of Coligny Plaza. Keyless lock system is installed. No worry about losing the keys, waiting for another family member to arrive to let them in. Our guests really appreciate the convenience of this feature.